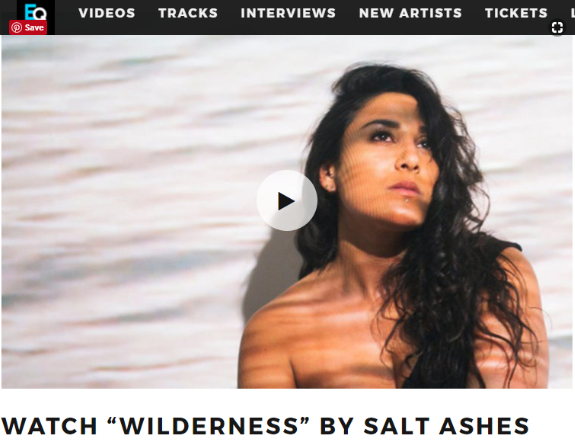 EQ Music Features Salt Ashes Music Video for "Wilderness"
Emerging electronic singer-songwriter Salt Ashes recently unveiled her music video for her latest single “Wilderness.” The music video was premiered on Clash Music, and has been receiving rave reviews worldwide. The video has been featured on EQ Music. Check out EQ Music’s feature below, and be sure to visit eqmusic.com for more! Salt Ashes self-titled debut album is one of dark disco meets sweetly spun electronic pop songs which I have been obsessed with ever since it was released last year. It is an album which hasn’t received nearly as much acclaim as it richly deserves to my thinking. It is a pleasure to listen to because the production is especially stunning, coupled with beautiful vocals, great songwriting and beautiful melodies through out. There hasn’t been any great need to rush to the singles out as is the case with most album campaigns because this album has the timeless qualities of a classic. Less than hot-on-the-heels of the previous single “Save It“, Salt Ashes dips back into her debut long player to give the sonically harmonised track “Wilderness”, some visuals. Damn, she could have had her pick of trendy bars residing in Brighton, but instead in the making of this video Salt Ashes and her love interest co-star flew out to Portuguese city of Faro to hit the clubs and pour a few tequilas down their neck. Just so, we can better appreciate her interpretation of what it feels like to be recklessly in love. “Wilderness” can be found on Salt Ashes eponymous album, which is available for purchase in record stores nationwide, on Amazon, iTunes, Bandcamp, Google Play, and in the Radikal Records web-store. It is also available for streaming on Spotify.